Multi-million dollar building projects can take years to complete and are usually bid a few years in advance of before shovels hit the ground. Recently, this process has become more difficult for estimators given the steep rise in materials costs and the uncertainty of the construction labor market. In fact, prices are rising well beyond the expected consumer price index, mostly due to tariffs on steel, aluminum and wood imports. Supplies such as HVAC equipment, girders and even nails are also being affected. The Trump administration's 20 percent tariff on imported Canadian lumber, imposed in January, along with shortages due to the devastating wildfire season and additional marketplace factors have driven prices up by 40 percent since last year. Some, but not all contractors, are putting price escalators into their bids going forward that call for reimbursement by the client if the need arises. Price escalators in the current economy should be included into every lump sum contract. A key consideration when lending into large construction projects is a builder’s business backlog. Let’s assume a project costs a hundred million dollars and is two years from completion. Then, within that time, frame material costs rise as much as 50 percent. The numbers being represented as backlog are now wildly inaccurate and you don’t want to get caught up in lending into a negative backlog situation. Every construction company’s financials are based on estimates; that is, a job is estimated to finish at X price that is the baseline of recognizing revenue. If that estimate is wrong and doesn’t match the real bottom line, the profit of the business will be misstated. Balancing the books given today’s fluctuating trade constraints and market conditions is a bit like predicting the future through a cloudy crystal ball — it can be pure fantasy. Regarding the industry overall, we have not heard, dark tales of gloom and doom. At the same time, there does not appear to be a slowdown in material cost escalations that continue to erode profits. These were unexpected, and many were caught off guard. Looking ahead, one can only speculate on which way the current administration will trend on trade policy. Pricing may also be rising because of margin compression, other input costs on the supply side, or simple supply and demand. If they can't grow their volume, they've got to grow through price increases to realize revenue targets. Additionally, labor costs for suppliers and contractors are rising. More concerning than material increases is the number one issue plaguing construction is qualified skilled workers. It is hard to find everything from wrench turners to project managers. This shortage, in turn, gives labor the upper hand. There are so many unfilled positions that project managers can negotiate higher salaries and threaten to leave if their demands are not met. Construction also lends itself to a transient workforce as skilled tradesman understandably move to where they can earn a living, be it another state or a different country. Contractors have to have steady work for their people at competitive rates or face employee shortages and project slowdowns. As such, it is important for lenders to know a company’s wage history, workflow and project completion rates in order to minimize risk of future default due to labor challenges. We have just gone through one of the biggest growth periods in our history over the past decade. Understanding the sustainability of a business and how the business has fared is an important component for a potential lender to examine. What sets Company A apart from other contractors? Why is that company that much better? Why are they going to grow at 5 or 10 percent of the next year? Is their growth controlled? It pays to be wary of a company that is talking about exponential growth. Given today’s labor market, you’ll have to wonder how they will staff all of their work. Are they going to be able to perform on all of fulfill their contracts? Why did they book so much work? One potential answer could be that they possess a lot of overhead costs. They are trying to be a much bigger company and area getting out over their skis too far. An effective tool that will help you determine if a company is worthy of investment is to conduct a buy side due diligence process. Looking under the hood in this way can uncover important details that could otherwise be missed. If I'm lending to you or I'm providing you access to capital or liquidity what percentage of my risk is based on collateral, and how much is dependent on the future cash flow of the business? Collateral can be a slippery slope given the nature of the construction business. When collateral is based on equipment or supplies tracking those items down can be a difficult and costly venture. Also, equipment prices fluctuate in the market, and, for some manufacturers, may have peaked. 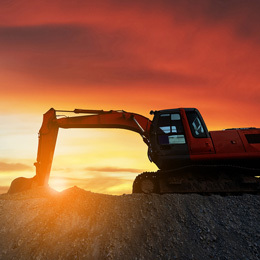 Collateral – in this case, construction building equipment – may not be as valuable in the secondary market as it was at the time when the agreement was struck. Another way to minimize risk is to look closely at industry sectors that are experiencing growth and those that are seeing a decline in activity. For instance, the domestic residential sector, which includes single and multi-family housing, is cooling off. Conversely, municipalities and the federal government will be spending money on infrastructure projects, from roads to bridges and public works. Projects like these are planned and bid years in advance. They usually continue even if there’s a change in administrations. A caveat on having government as a customer is to understand the potential for delays or government shut downs. So, it is imperative for builders to protect themselves by installing price escalators built into project bids and have enough cash on hand to withstand the potentially slow pace of government contracts. Ideally, when all is said and done, you should seek projects that hit a particular company’s sweet spot. One that matches the size and scope of work of their past successful projects, has a positive backlog cash flow and is prepared for rising material and labor costs. The recession rebound provided a sustained growth in the construction industry. Is the business you’re considering prepared for the next sector slowdown? Michael Beaver is a Managing Director at Conway MacKenzie. Beaver is a Certified Construction Industry Financial Professional (CCIFP) Certified Public Accountant (CPA), Certified Insolvency & Restructuring Advisor (CIRA), Green Belt Six Sigma (GBSS) and Lean Sensei.